I've often wondered how I could give back to my surfing community. Like many, I help out some at charity surf festivals and picked up a lil beach litter ... but I wanted to do something special. Recently a surf bud of mine in his late twenties was lamenting on how he was having trouble finding good work with benefits because he didn't have a college degree. He said he averaged only a "C" in high school and that his single Mom could not help out financially. So he gave up on the idea of going to college because he just didn't think he was "college material". Yet he wanted college, but those circumstances plus starting a job so he could surf all the time combined to eliminate a college plan. So I established an Annual $1,000 Surfing Scholarship designed for students who may not consider themselves as college material. I set a low academic standard (2.0 GPA), the student must enjoy surfing (but skill level is not a factor), the student must submit 2 letters of reference and a 250 word typed essay... "What surfing and a Higher Education Mean to Me", and attend either a 2 year college or 4 year college full-time. I decided to not be involved in the award selection process. 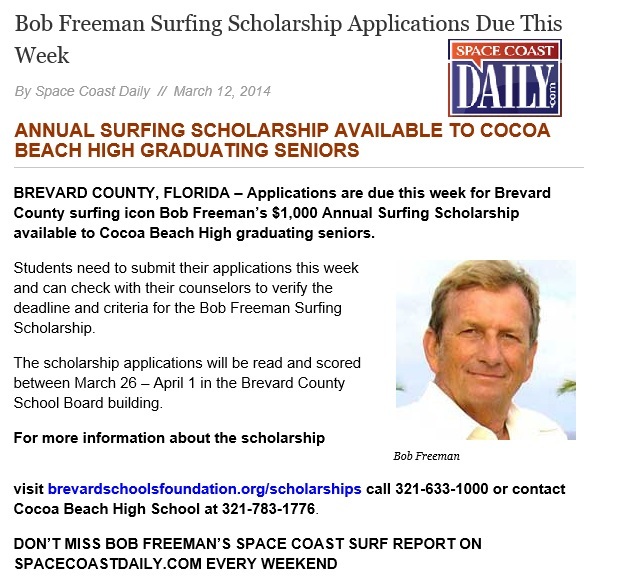 But plan to attend this year's Cocoa Beach graduation ceremony to present the award to a deserving student.